Life on the boat, back and forth with the dinghy! Since we are staying on a mooring, we got to take everything to the boat on the dinghy. Here is a little bit of our everyday life! Mast and arrival in México! A video with our friend Ivan in Cabo San Lucas. Surf in Punta de Mita! The waves werent that big, but we had fun! It had music but youtube blocked it. Here's a video with Canela sailing the wather of the pacific. Here is a video with some tips, but in portuguese. For those who know us its easy to understand why we are so happy about our new dinghy. We spent the last 6 months of the trip with a half flat dinghy. Not that its was a big deal, we manage to do everything we wanted, but the truth is that our lives are going to be a lot easier from now on. 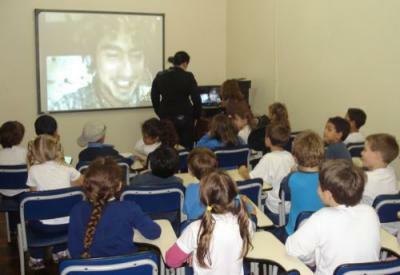 Destino Canela did a video call to all the students of the first grade of the school Maria Imaculada, in Canela. The students are learning the letters of the alphabet, and now are learning the letters of the countries that are going to be on the worldcup. Since New Zealand is on the world cup, we were able to talk to the kids and explain a little bit about this great country and its culture. Here goes a video made by our good friend Molão of our sailing trip to Great Barrier Island. Soon we hope to post on the website the full version. Here goes a video from our first 20 days in Fiji, enjoy! 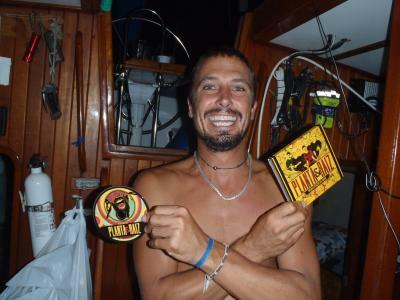 Here is ou great friend João Sombra, from the boat Guardian, saying a few good words about Canela. Showing some of our "routine", the places we have been and how are the dances of the local peoples. This video shows our trip from New Zealand to Fiji, in june. Was 9 days just looking the sea, and everyday feeling the hot weather coming. A new video about our trip from Fiji to New Caledonia that took place from 18 to 23 of november. We really want that everyone enjoy this video because we did think about you guys. And i think this video shows that sailing is not as complicaded as it sounds, you just want to make things and believe in your dreams. This movie is about an interview that we did with the band The Beautiful Girls, from Australia. 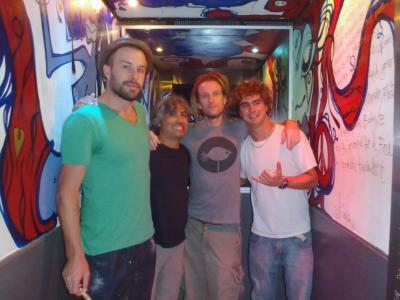 The interview was last week in Coolangata, when we had the opportunit to meet the band and ask them some questions. We would like say a big thanks to Mat, Bruce and Paulie and all their team, for making us feel very well at that time, and for answering our questions with excitement. We really appreciate your songs! Just to finish, I wish a happy bday to my friend Gustavo, a big hug, and say that he is a important vibration to Canela, and without him it could not happen..
Today was a special day for us! Destino Canela was on Australian TV today on NBN channel 9. A camera crew came over to the boat and made a reportage about our project, interviewing everyone and took some shots of Canela. The interview was recorded in the morning and then we had to wait until the afternoon at 5.30pm to watch it on the Gold Coast News. It was very emotional. The interview was short but very well told. This movie is a capture of the TV screen while the reportage was on air but in a couple of days we will upload a proper version of it with better quality so keep an eye for it here on the site. 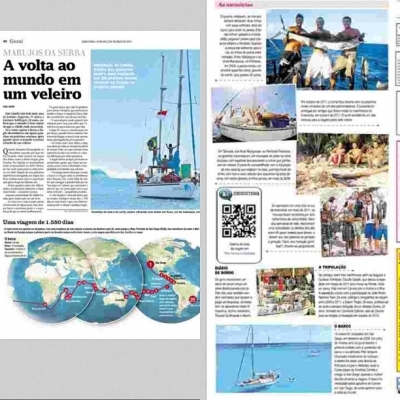 This video is to show to everyone how was the visit of the band Planta e Raiz a few days a go on our boat. Words can't translate what we felt in that day, when all the band came aboard of Canela! Watch the video and feel the vibration! After we left Surfers Paradise we had a stop in Yeppoon. We spent the weekend on that lovely town and had the pleasure of the local TV and Newspaper covering our stay. Check Destino Canela on Cairns Channel 9 - WIN TV. We are already in Darwin. Last week we got our Indonesian visas, so now we are just preparing the boat to leave, and it probably gonna happen wednesday morning. We cant wait to get there and surf as much as we can. We made this video to show to everyone how excited we are. Click on the link below to see the new video. Soon we are going to have it posted here on the website. 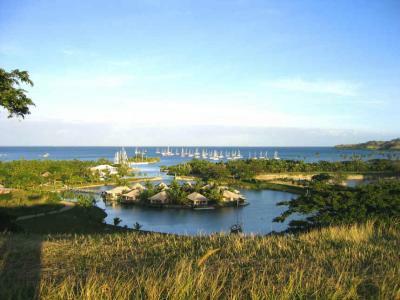 Video from Desert Point and Gili Islands! This video is about our second part travelling in Indonesia. Click on the link bellow, and enjoy it! 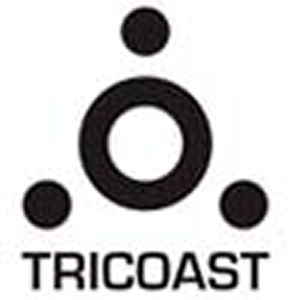 Destino Canela now counts with a surf partner, the brazilian surf board company Tricoast will support the project by providing the crew with surfboards and midia. Check it out on the link bellow to watch the video of the new surf partner!! Since Little Jonh left we haven't published any new videos, as he was the one who knew how to edit them. Now, as we have new equipment, we felt motivated to learn how to use Imovie and this is the result, we hope you like it.